Recently, the link between overwhelm and the Zeigarnik Effect (explained in my book) has become more apparent. There are tantalizing signs of its importance in recent research, which I plan to highlight as it emerges. There are few writers or researchers who are connecting these dots, due in part to the way the studies are being conducted – for the benefit of academic research, rather than everyday application. Dr. Michael Scullin and his team compared two bedtime behaviors in laboratory experiments. Before falling asleep, one group of subjects wrote their to-do list for the next few days. The other recorded the tasks they accomplished during that day. The result? This small change in technique helped the first group fall asleep faster by over 9 minutes. Why did this happen? As you may know, Quora is a question and answer website where people ask specific questions and receive answers from the general public, some of whom are experts. Since January 2016, I have been answering a number of questions in depth on different topics related to the work we do at 2Time Labs. Here is a sampling of the answers provided. I just released a new post on Medium about notifications, interruptions and notifications that will occupy the attention of 2Time Labs for the next several months. It’s a new concept called “The Notified Self” – the vision of a professional who is perfectly notified by the digital ecosystem formed by his/her devices, apps, platforms and programs. It’s the logical next step after the Quantified Self (QS). In other words, now that all this new data is available from QS, how does it need to be managed in order to benefit the user? Or in other words, how do we focus our attention on the data so we don’t become overwhelmed? Click here to see my long form post on how this problem needs to be tackled with respect to Interruptions. It’s the first part of a three part series. The second part on The Warned Self is here. If this a topic you already have an interest in, it might be an opportunity to apply to the next InnerLab. I just gave an update on a project underway here at 2Time Labs called “Can Time Be Managed?” Check this link for a short post on my book’s website. Between June and October I haven’t posted a single time to my blog. I have a good reason… but the bigger story is that a new calendar software I was testing saved my skin. Find out why at this post on my book’s blog and while you’re there, sign up for the exclusive private Beta i am excited to be launching. How I filled some huge gaps in knowledge that counter the prevailing wisdom. For example, college students arrive on campus with skills they are already using to manage their time, yet the majority of orientation programs designed to help them skip over this fact, leaving them with little or none of the specific assistance they really need. Researchers aren’t clear on this point so I had to push the issue in my book – arguing that if ALL the research showing that incoming freshman have some skills, and NONE of the research showed they lack all skills, that many researchers were simply incorrect in their starting assumptions. Of course, students know that they wouldn’t be in college if they didn’t have some productivity skills. Duh. Why people are so confused, and give confusing advice in the area of time-based productivity. 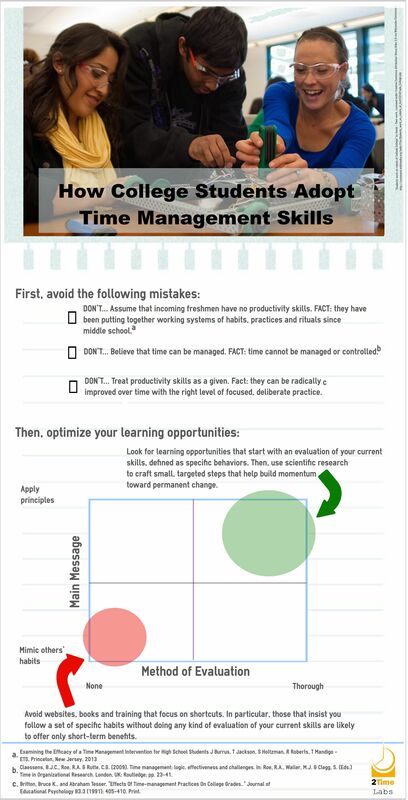 Search YouTube for videos on “Why time management doesn’t exist.” This year alone, they have been rolling out one after another emphasizing a fact that many already understand, including many incoming freshmen. People who try to manage (or control) time fail from the start – just try to video someone “managing their time,” show it to another person and ask them what’s going on in the film. Instead, we need to shift our attention to managing a psychological object I have labelled a “time demand.” Once you get the hang of seeing them, the confusion lifts. These are just a few of the concepts I have wrestled into my book. To sign up for early notification including free launch bonuses, visit my book’s website and join the list for further information. Who Cares What Time You Come to Work? A few years ago, I remember talking with a friend who was telecommuting and saving an hour each way in traffic. At first, it sounded great! That is, until I heard about the electronic snooping, keystroke recording, logging and clicking in, and webcams that were used to track whether or not she was really working or goofing off. It sounded worse than working in the office. A couple of companies have moved in completely the opposite direction, and given their employees complete freedom to set their own hours. What’s remarkable is that these companies are are well-known national retailers: Best Buy and the Gap. While this is good news, it would be interesting to know what the impact might be on the productivity of the salespeople who are the targets of the ROWE program. (ROWE stands for “Results Only Work Environment.”) That would truly get the attention of forward-looking companies. What caught my attention, however, was the fact that there was a control group that did not sign up for the ROWE program. It made me think that there might be some who are just not interested in that much freedom, and just want to collect a paycheck for doing a certain amount of work. It also made me think that the company would do well to give their employees in the ROWE program an opportunity to upgrade their time management skills. Simply giving employees the ability to manage their own time does not necessarily mean that they are more effective. In fact, giving them more freedom would make things more difficult for anyone who must now make a number of new decisions about how they schedule their time, for the very first time. Without higher skills, they could easily find that their productivity drops. This isn’t as unusual as it sounds. Whenever we undergo major life changes, it’s often the case that a review and upgrade of our personal productivity is required, just to be as productive as we were before the change occurred. For example, I moved my place of residence over the weekend to an older residence with a gorgeous view of the Jamaican interior. As beautiful as the view is, moving has always caused a dip in my productivity as habits that were prompted by the physical environment need to be re-crafted from scratch. The effect of these major life changes, whether they be a relocation or a ROWE program, is tremendous, and they deserve to be respected as such. It’s a good time to revisit our time management systems to see whether or not they can, in fact, hold up.